Embroidered Originals by Sue Rangeley. 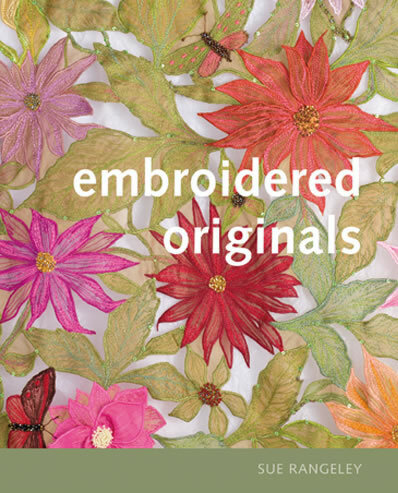 Inspiring and lavishly illustrated, 'Embroidered Originals' expresses a love for the language of embroidery, while revealing the artistry of Sue Rangeley's stunning creations. Exploring in detail the journey from 'Studio Inspirations' into the practicalities of embroidery techniques. Sue's text and samples unravel the stories of each embroidered original. Embroidered Originals provides a unique insight into the creative world of a contemporary embroiderer, offering a captivating fusion of fine art, design and craft. A comprehensive 'Studio Techniques' section highlights the rich diversity of the processes used by Sue. Forty techniques are described in detail, offering a practical guide for embroiderers and textile students. A book to enchant and inspire, giving new directions for creative stitch. Embroidered Originals is a visual treat for those interested in fine craft textiles with a touch of fashion pzazz. "Embroidery is a timeless art,ever changing, enchanting the eye with stories in fabric and thread. Stitch has the power to stir emotions, inspire dreams and conjure a little magic"
Each year Sue presents a few lectures or ‘Pop-up Studio’ events where visitors can see embroideries and designs, from ‘Embroidered Originals’ publication and her latest creative work, click here for details Lectures & Pop-up Studios. With each signed copy of ‘Embroidered Originals’ comes a set of Sue’s postcards; plus an instruction sheet & sample of water-soluble voile for making the machine-embroidered lace as featured in the book. This popular creative embroidery book is nearly out of print, only a few boxes left now! Sue’s next book is on the way, just a few more embroideries to finish for photography.